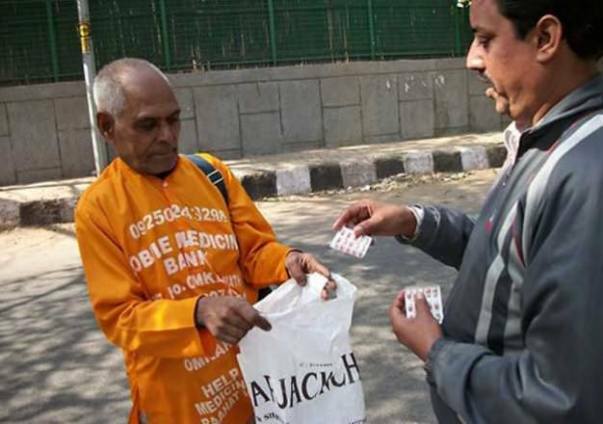 Omkar Nath Sharma born in India (around 1940) also known as the “Medicine Baba” (Medicine Monk), is a retired blood bank technician from a hospital in New Delhi, who voluntarily collects unused medicines from people and distributes them to the poor free of charge. 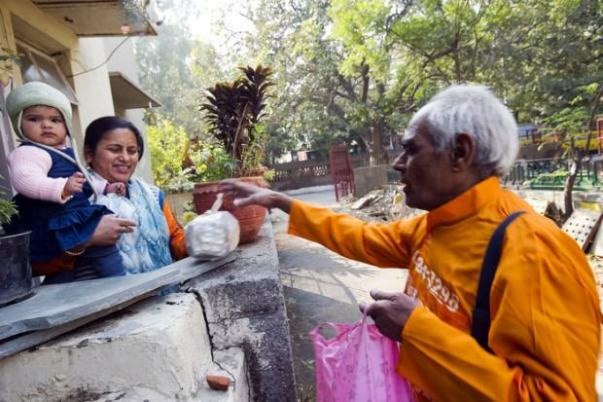 Omkar ji started collecting medicine after realising the acute lack of accessibility of medicines, when he witnessed Delhi Metro under-construction bridge collapsed in East Delhi in 2008, claiming the lives of two labourers and injuring many others. The local hospital administered basic first aid, but nothing else and the injured returned home to die, unable to afford the cost of treatment. 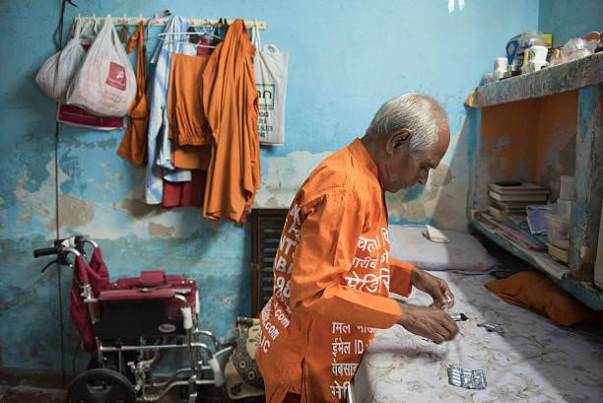 That shook Omkar ji and he became determined to not let something like this happen again.Since last eight years wearing a saffron kurta (shirt) that says “Mobile medicine bank for poor patients”, Omkar ji starts every day at 6 am from his rented home in the Uttam Nagar slums and goes door to door in different areas of Delhi asking for unused medicines, which he then distributes to charitable hospitals, NGOs and clinics. Crippled at the age of 12 in a car accident, Omkar ji walks five or six kilometres per day. 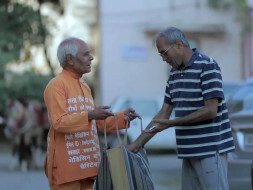 He cannot afford the metro rail fare, so travels by buses with the help of his senior citizen pass. In remote areas where buses do not ply, he simply walks. To carry out the vision of Medicine Baba, the trust was founded in early 2015 and registered under INDIAN TRUSTS ACT 1882 under registration no. 1240 with its founder pillars Mr. Omkar Nath Sharma (Medicine Baba), Mr. Sacheen Gandhi & Mr. Arun Hooda. The trust wants to create awareness, create supply chain network of medicines, speedy process management in order to provide the best possible medical aid to the one in grief. 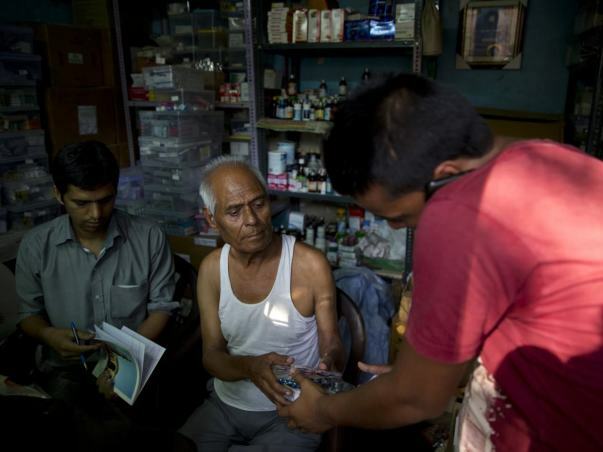 The dream is too not let anyone die due to the scarcity of medicines. With an appropriate quantity of medicines arriving at our collection centers we are willing to set up the distribution centers at slum areas (such as Nangloi/Bawana/Gazipur and many more). Vision of Omkar Nath ji is that we need to reach the poor & needy for medicines instead he or she coming look for us, more and more distribution centers means faster allocations of free medicines to the one in need. Approximate cost of setting one center in New Delhi is 3 lakh rupees (furniture/fixtures/refrigeration facility/ pharmacist cost & more) and with a vision of setting 5 centers in coming 6 months we have to make his dream come true. Thank you all for your love and support. Our Trust has purchased 20 sets of top-sheets (Blankets) for our needy patients. Your support has helped us a lot to go ahead with our actions. Thank you for your love! This means a lot to us! Medicine boxes received for installation into the apartments for unused medicine collection. We shall keep you posted. Thank you once again! Thanks to you all for your valuable support for society , from your support we purchased Medicine Donation boxes for medicine collection , this is really great help. Thank you! We shall keep you posted.